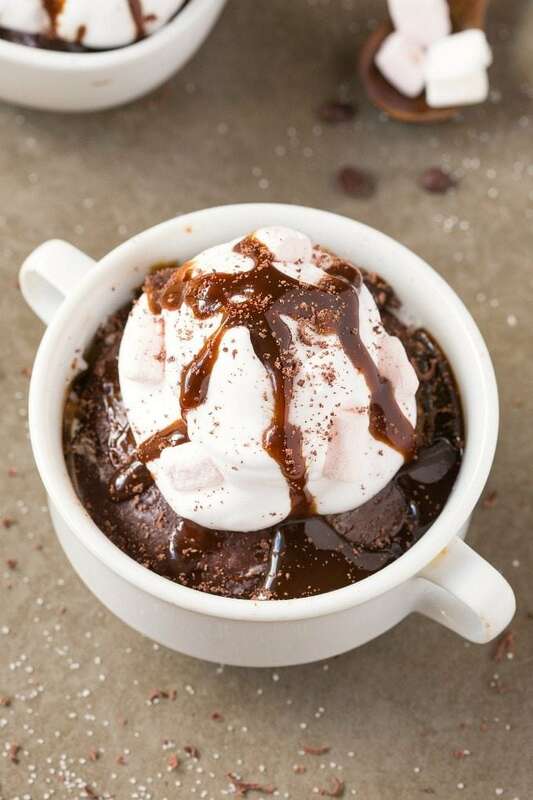 This healthy keto hot chocolate brownie mug cake is moist, gooey and fudgy, and packed with protein! Made in just 1 minute, it’s a quick and easy dessert recipe, loaded with chocolate, and made with coconut flour! Paleo, Vegan, Gluten-Free, Sugar-Free, Low Carb. “Coffee is the grossest thing ever”. Good thing my sister isn’t a blogger. If you are anything like me, coffee has taken second place to water and even before food. If forced to pick between coffee and a sandwich, I think I’d easily choose the former- Purely for the sanity of those around me. Actually, I take that back. I could say the same about food, so I’d best be greedy and choose both. My sister is made up of faults has many faults, but not enjoying coffee is one of her main ones. Not only does this prove my personal theory that she’s adopted, it just doesn’t make sense! Even my mother, who comes from a country in which tea is a staple, enjoys her cup of joe every single day. My sister is, however, a self-proclaimed hot chocolate connoisseur. The other day, my sister had the biggest craving for hot chocolate but also was craving brownies. At the time, I was working on an easy keto chocolate mug cake recipe. I decided to make that for her but adding a hot chocolate twist to it. Instead of adding protein powder, I omitted it and crossed my fingers. What resulted was a gooey, fudgy brownie mug cake, loaded with chocolate, and secretly healthy! Because she also had a craving for hot chocolate, I added some dairy-free whipped cream and some marshmallows, just for fun. 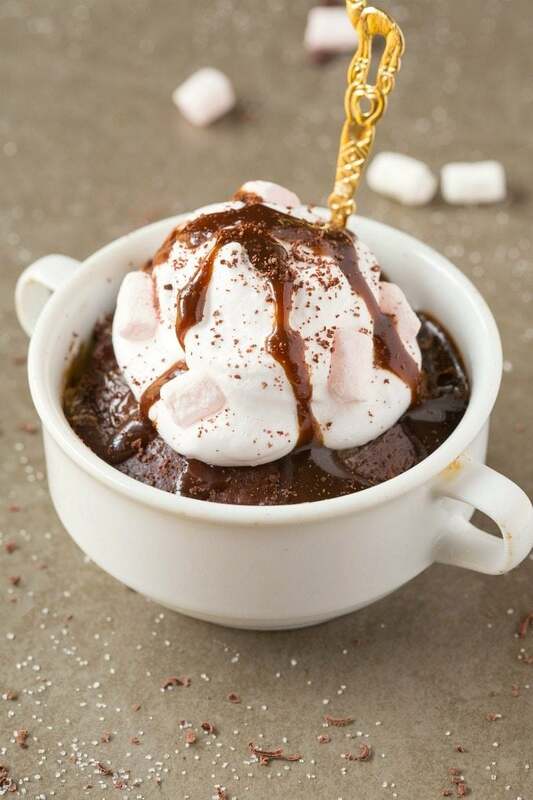 Enter- the healthy hot chocolate brownie mug cake! 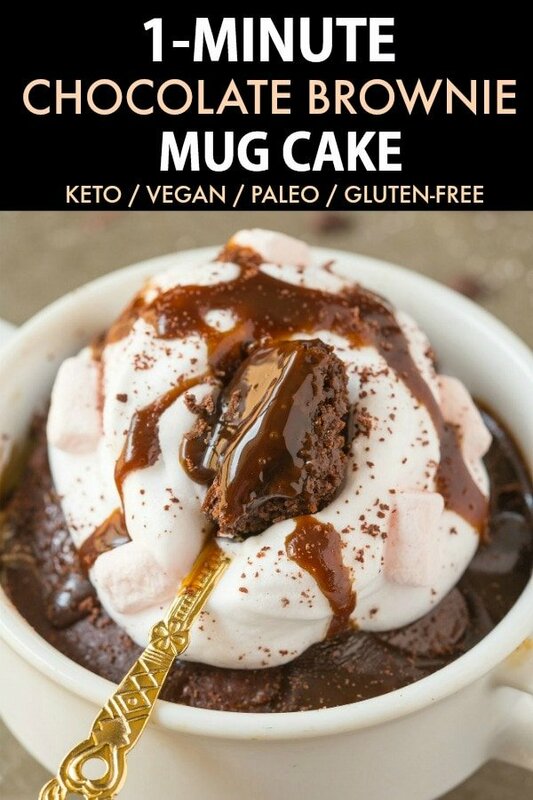 This healthy keto mug brownie cake has all the best bits of a classic hot chocolate, except in a brownie mug cake form! Not only that, it’s really in less than a minute, but it is secretly healthy too! It’s moist and gooey in the center, and tender on the outside- Perfect to top with whipped coconut cream and add a drizzle of healthy chocolate sauce. It’s also able to be made in an oven, for those without a microwave! Unlike traditional chocolate based cakes, this mug cake contains no butter, oil, flour, grains or sugar, but tastes delicious, thanks to a few cheeky ingredients and tricks! This chocolate mug cake is super low carb, by using a high fiber grain free flour, coconut flour! It also requires no eggs and no dairy, thanks to pureed pumpkin. Pumpkin fiends, I promise you won’t taste it whatsoever- It only adds moisture and a fudgy texture. A drizzle of chocolate sauce. Pssst. Want a mug cake WITHOUT protein powder? You can use this chocolate mug cake and simply top it as desired- It will be just as delicious! This keto chocolate brownie mug cake is the BEST vegan and keto chocolate fix ready in one minute! An easy keto chocolate dessert recipe made with coconut flour and super low carb- No sugar, NO eggs and completely paleo and gluten-free! Grease a microwave safe bowl with cooking spray and add all the dry ingredients and mix well. Add the sunflower seed butter (or nut/seed butter of choice), pumpkin puree and mix well. Using a tablespoon, add milk of choice until a gooey batter remains. Microwave for 55 seconds-2 minutes (depending on your microwave power) until 'just' cooked. Top with optional whipped cream and chocolate drizzle and enjoy! In an oven-safe ramekin, follow instructions as above. Once prepared, bake for 10-12 minutes, or until 'just' cooked. 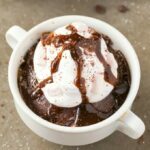 Keto Hot Chocolate Brownie Mug Cake (Paleo, Vegan) can be prepped in advance. Add 1-2 tablespoons extra milk before baking. Cookies can be low carb AND tasty- This one is giant and single serve! A smooth and creamy dip which tastes like dessert, but could be perfect for breakfast! Protein bars which don’t taste like chalk- Soft and chewy is the answer here! Oh, coffee, how do I love thee? Let me count the ways… Hah! I do love my morning cup o’ joe. In fact, Laura and I just picked up some ‘fancy’ local coffee beans. They made for a good cup of coffee…but get this. We actually prefer our Trader Joe’s coffee over the fancy, local stuff. Anyways. Hot chocolate. There’s another good one! But not hot chocolate out of those little powdered packs. Hot chocolate like the real deal Holyfield stuff. It’s hard to beat! Love the mug cake idea. I need to have a mug of coffee to drink alongside this mug of hot chocolate cake! OMG. The number of times I used to circle around TJ’s just to get a shot of coffee….. I can’t handle the deliciousness that is this mug cake. I’d like this in a shooter form so I can just KNOCK BACK a few! JK that’s too cray cray! Mmmm coffeeeee. I definitely love my coffee and maybe once a year I’ll have hot chocolate, like when it snows. Dude, this was one of the more comprehensive conversations we’ve ever had! I pray for the days where coffee once again replaces red bulls! lol I absolutely could not decipher her definition. But I do remember having one of the most indulgent hot chocolates in Sydney at some hot chocolate cafe… Max’s perhaps? MAX BRENNER 😀 There is a newer competitor called Koko Black…SO GOOD! Hahaha, I need to upgrade my repertoire! Sorry, not quite sure what your sister is saying… but thismug cake looks perfect! Definitely adding to must bake list! That gold spoon is cracking me up almost as much as Niki’s description. I couldn’t live without coffee these days. Seriously, it’s my everything. Better than booze even. This looks too good to be low carb! I used to be team hot chocolate until about 3 years ago. Now I’m freaking addicted to coffee. Sigh. I’m craving coffee, but it does nothing for my productivity these days. Bring on the red bulls! Eh, I’m going to have to say that coffee isn’t exactly a staple in my diet either! I prefer green tea 100%. However, I do LOVE the flavor of coffee in other things! Looks amazing! You mention this has protein podwer in it, but there is none listed in the ingredients. Did I misunderstand or is it missing from the list? It was absolutely delicious! Thank you!! I cooked mine a little longer, about 1 min 30 seconds because my “batter” was thinner. I added some rice milk to the blender because it was too thick to blend. But it came out fabulous! That’s what I like to hear, cheers Christine!